“Shadows lengthen; the sunlight fades from cloud to cloud, kindling their torn edges as it dies from softness to softness down the prairie sky. 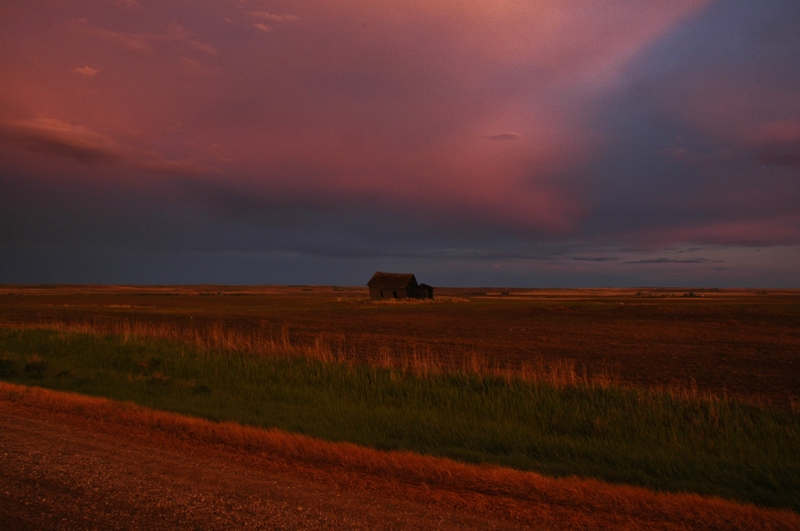 A lone farmhouse window briefly blazes; the prairie bathes in mellower, yellower light, and the sinking sun becomes a low and golden glowing on the prairie’s edge. I arrived home earlier this evening in the midst of a thunderstorm. I’d had a long day of driving home from Winnipeg, and encountered more than one storm along the way. I both love and fear thunderstorms. They are a common occurrence here in the summer. I am awed by their power and beauty, but also frightened by the destruction they can cause. I also have a real fear of getting struck by lightning – which is a more common possibility than people usually think! But no matter what a storm brings, it is always calm in its aftermath. There is nothing as spectacularly beautiful as the light after an early evening thunderstorm. The sun slants its golden rays, conspiring with the retreating moisture laden clouds to create rainbows. I waited for the storm to pass so I could take my new camera lens to chase some of the best light there is in the world, if you’re into landscape photography. Sometimes I think I am addicted to this landscape. I can’t stop staring at it. If I could bottle it up and drink it, I would. The thing is, though the topography remains the same, the light is constantly changing. It’s like the sea in that way – always dynamic, never static. No two sunsets are ever the same, nor two sunrises, not even two noons. There’s nothing for it but to keep chasing the light. * W.O. Mitchell. 1947. Who Has Seen the Wind. Toronto: Seal Books, 59. Have passenger trains always seemed romantic? Or were they just as utilitarian and ho-hum as highways? Probably. But they seem very romantic now, especially in Saskatchewan where they have all but disappeared. There’s the Via train which connects the Pacific to the Atlantic. I journeyed to Halifax that way three years ago. To get to the train station, I had to drive two and a half hours. There was something a bit ironic about that, I thought. Now there’s another option. 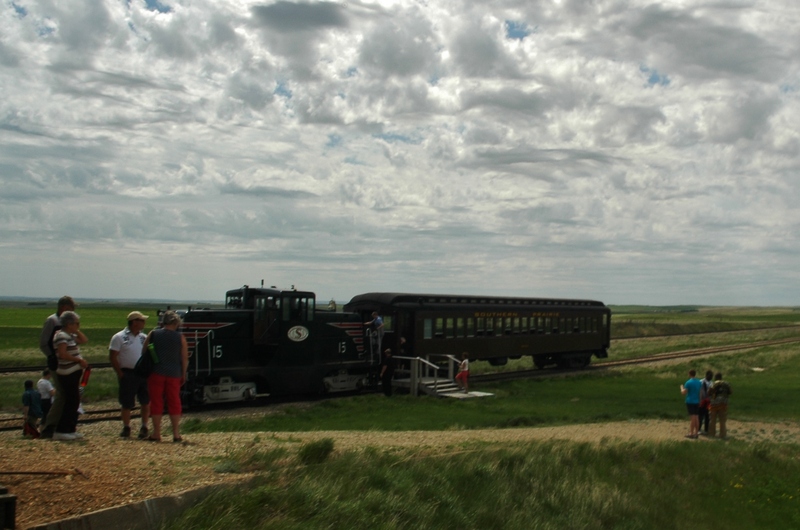 The enterprising town of Ogema, population less than 500, has a tourist train. 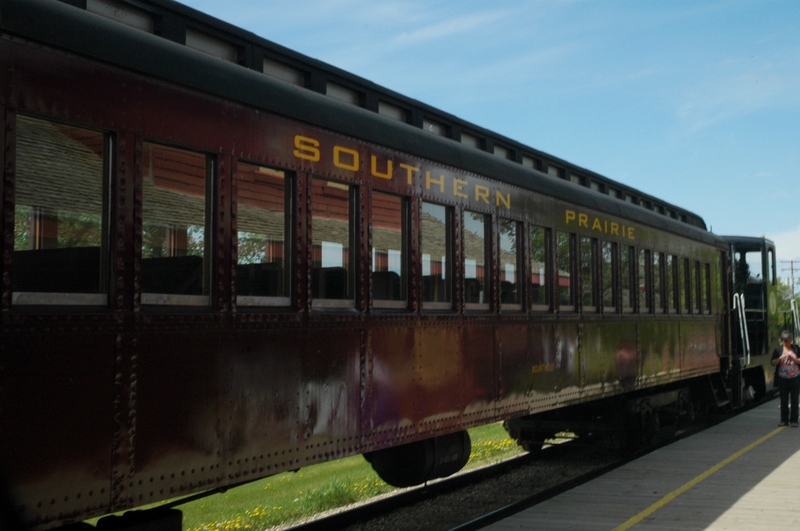 The Southern Prairie Railway allows train lovers and prairie lovers and curious tourists to rumble through the rolling prairie of southern Saskatchewan at 25 kms/hour. I finally went yesterday. It was a perk of my new job working at Ogema’s Deep South Pioneer Museum. As the train chugged out of the station, and the lush late May countryside rolled past, I had a lump in my throat. Not everyone loves trains, but I do, I really do. Even the smelly, congested trains of Great Britain which are anything but romantic were a treat for me. Even the claustrophobic, nauseating subway is something special for me. So to be on a train in my very own backyard (just 28 miles from home) was more than special. The CNR tracks are about two miles south of my farm. They connect Radville to Ceylon, through Hardy and then on to Bengough. From any of those stations you could get on a train that would take you somewhere with more tracks that could get you on a train that took you anywhere, even to the sea where a ship could take you across it, back to the homeland perhaps. It’s been at least a decade since I last saw a train go by on those tracks south of my farm. Even when I was a kid, when the elevators were still in Ceylon, it was a rare enough sight to be noteworthy. But my school bus driver always stopped at them and opened the doors to look both ways down the track. There’s no need for that now. Before the tracks came to Ceylon in 1910, the homesteaders had no transportation but their own two legs or horses. The nearest station at first was Yellow Grass, about thirty miles northeast of my farm, as the crow flies, or the horse and wagon ride. 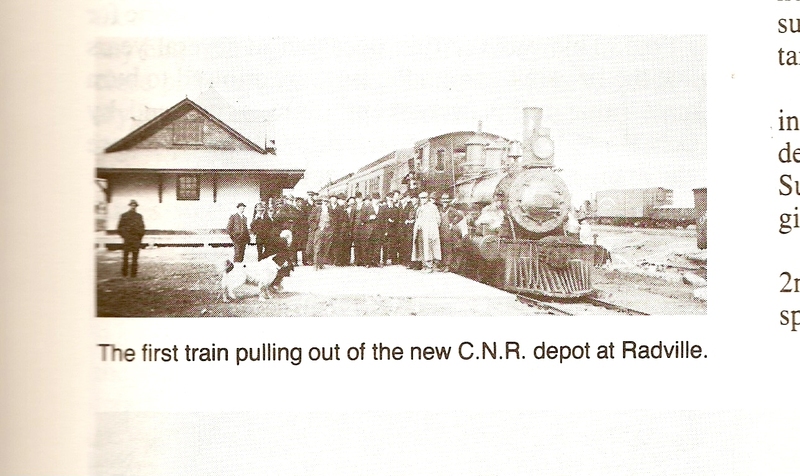 Many would have pressed on for Weyburn, about forty miles east, since it was bigger and had more amenities. They had to lay in enough supplies to get them through to the next trip. They had to make sure they had enough food and fuel to get through the winter. Sometimes they did not. There are stories of homesteaders surviving on nothing but flour for weeks. Once a homesteader near Ogema ran out of coal to fuel his stove, so he moved into his sod barn and took his newly built frame house apart, using the wood for fuel. There are stories of people braving extreme weather to walk or ride to a neighbour’s house to ask for food. Now the tracks that run through the Gap are growing weeds. 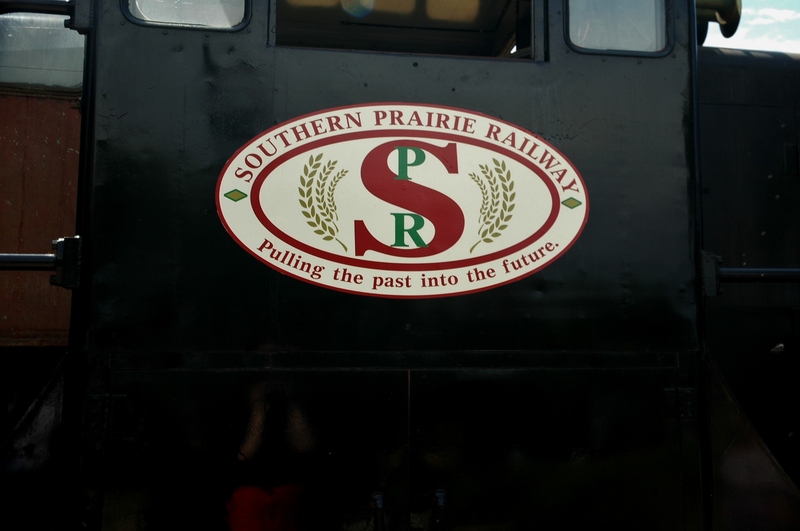 But the Southern Prairie Railway provides the opportunity to get a sense of what it was like “back then” before cars and highways and semi trucks. The train was not a peaceful, scenic journey then, though it could be. It was a vital part of prairie life. It was what created the towns, and it dictated the rhythms of people’s lives. No wonder it seems romantic now. *Builders of a Great Land: History of The Gap No. 39 Ceylon and Hardy. 1980. History Committee of R.M. of the Gap No. 39, 3. – Memories of Ogema and District Pioneers, “Tales of Old Timers,” 43. In medieval Europe there was a tradition of beating the bounds on Ascension Day or sometime during Rogationtide (the three days leading up to Ascension Day). Rogationtide, derived from the Latin rogare, to ask, was an official Church sanctioned observance on the calendar. 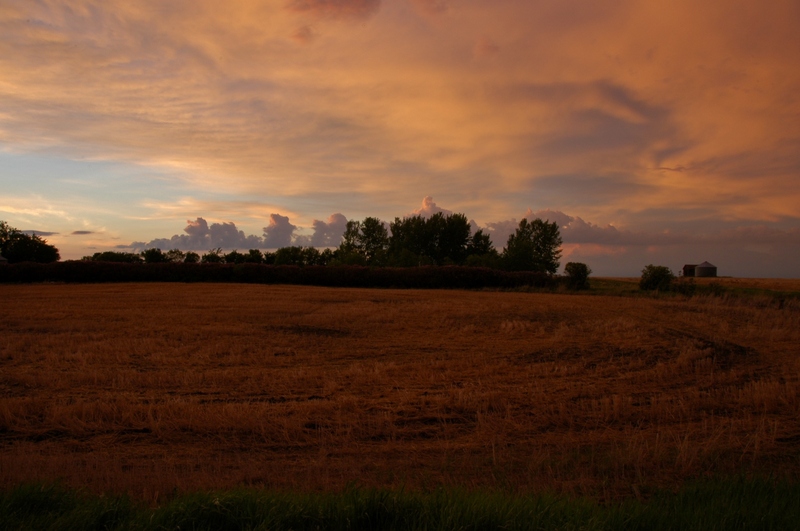 It was a time to pray for God’s blessing on the crops and the prevention of natural disasters like plague and drought. Processions were held throughout the parish, and beating the bounds was part of this. Though it was a religious event in the Middle Ages, the practice of beating the bounds could be far older. Some scholars speculate it was derived from the Roman festival Terminalia, with others claiming pre-Roman “Celtic” origins for the practice. Whatever its origins, it is clearly folkloric in nature. Boundaries have been important for as long as humans have claimed certain spaces and places as their own. In the centuries and millennia before ordnance maps and road signs, boundaries existed in folk memory only. One had to remember that this side of the river belonged to us, but that side of the river did not. This grove is ours, that hill is theirs. During the beating of the bounds, young men sometimes had their heads bashed against rocks or trees, or had to wade across streams so they would have a physical memory of the boundary. People marked the boundary spots by flailing them with willow wands or switches of hazelwood. Some places in England still carry on this tradition, though with less bashing in of heads. As far as I know, no similar tradition exists in Saskatchewan. However, yesterday was Ascension Day, and if there is a better way to spend a Thursday evening than perambulating a quarter section, I don’t know it. And so I beat the bounds of my family’s original homestead quarter. There was no beating or bashing of anything, just the occasional stamping of feet from frustration at the hordes of mosquitoes feasting on my flesh. But it was a good exercise, in more ways than one. Each quarter section being a 1/2 mile long, I walked two miles over freshly seeded ground. And it was an exercise in observation. Why did my great great grandfather choose this particular piece of land? He was one of the first in the Gap country to claim a homestead, so he had the pick of the land. It had not been surveyed yet. According to family history, Grandpa Tom and his brother Jim “travelled over a lot of land and decided on the land we now have.” It is not written why they chose it. As I ambled about last evening, I tried to figure out why they might have done so. It’s relatively flat. The soil is heavy, lots of clay. 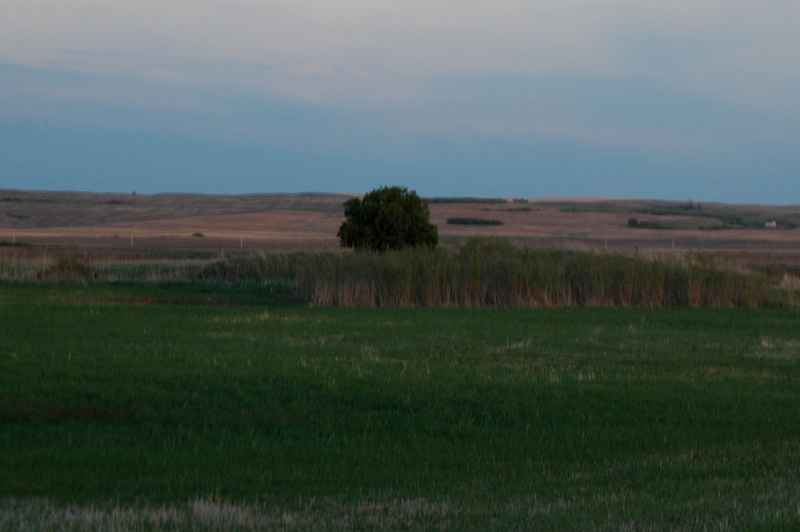 Perhaps the native prairie grass grew more lushly there. There is a draw, a shallow drainage passage that funnels water from the spring runoff or heavy rains. Water is scarce in these parts, so perhaps this draw drew them in? However, there is a creek just a mile or so to the south. Why not homestead there, where the water was more abundant? When I got home, I asked my dad why they had chosen this particular land. 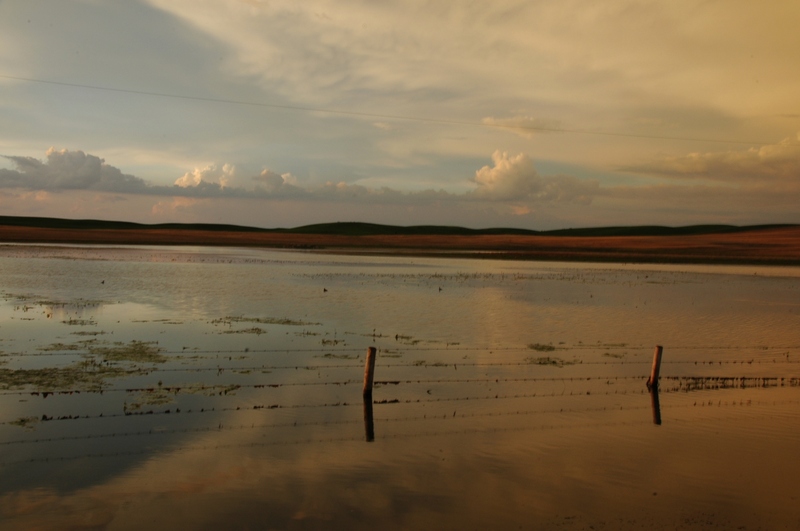 He said something about the grass growing thicker there, and about the “pothole slough” which provided a water source. I noticed this tiny body of water, more a puddle than anything, but did not think it was significant enough to photograph. Apparently I would not have been a very good land prospector. The draw winds its serpentine course. Though it doesn’t look like much, it’s a verdant paradise for insects, birds, rodents and reptiles, just as important a river valley as the Tigris or the Euphrates. So life-giving is this little passage for water, it even permitted the growth of a solitary tree. The lush vegetation produced by one modest draw: a profusion of cattails and a lone Manitoba Maple. 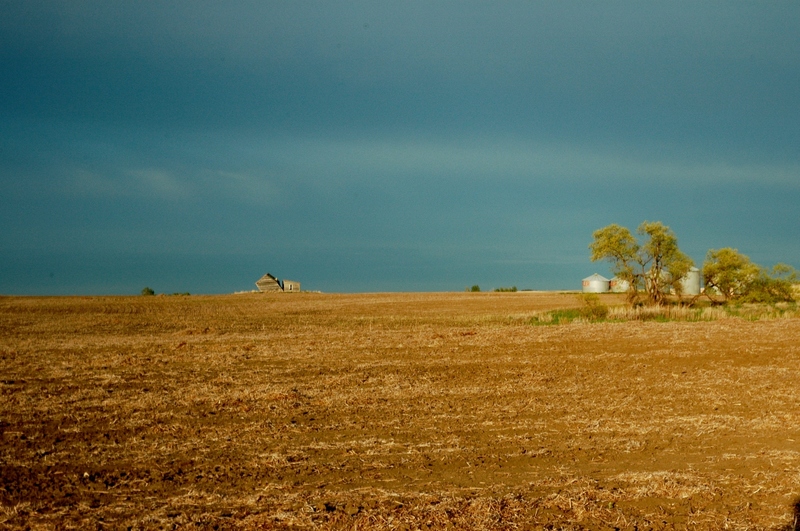 For whatever reasons they chose it, this quarter section (160 acres) became their new home. To prove it up, they had to pay a $10 registry fee and then they had three years to break ten acres of land a year, build a house and live on the homestead for six months each year. The first house was a “soddie.” After the three years, if the homestead had been successfully “proven up,” one could file for a pre-emption, the adjoining quarter section, at the bargain basement rate of $4 an acre. This was done, and by 1909 they had a half-section of land, 360 acres. In those days, that was something. 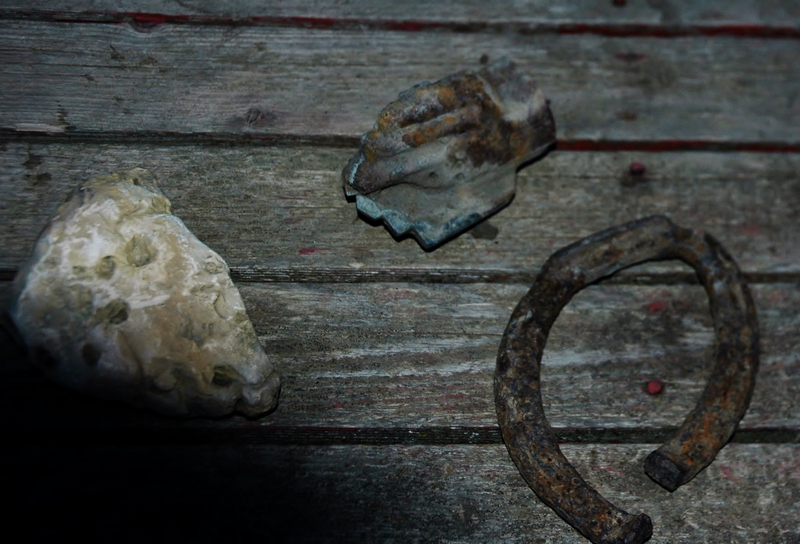 During my walk, I came across some fragments of the past: two were probably homestead relics, the other is far older. There was a horseshoe, rusted and bent out of all proportion. It’s a big one, so perhaps it came from a draft horse, thrown while pulling a plough or a hay rake. But my great great-grandfather Thomas had a blacksmith shop on the homestead when they first started out and my great great – grandfather Ernest Freeman who homesteaded a mile south was a blacksmith also; perhaps it was discarded from one of those smithies. I also found, not far from the shoe, some kind of part from farm machinery. There is a bit of writing on it; all that I could make out was “lbs” and “Canada.” Not much help. It’s very heavy, very rusty, but still in okay shape. I have no idea what it could be. When I asked my dad, he suggested some kind of gear from a threshing machine, the giants that were used before combines. In that case, it could be 90-100 years old. The last thing I found was a natural feature, here long before iron came to the prairies. It’s a mottled stone, not exactly an omar, but interesting nonetheless. It was probably caused by something glacial. just like the Gap country itself. 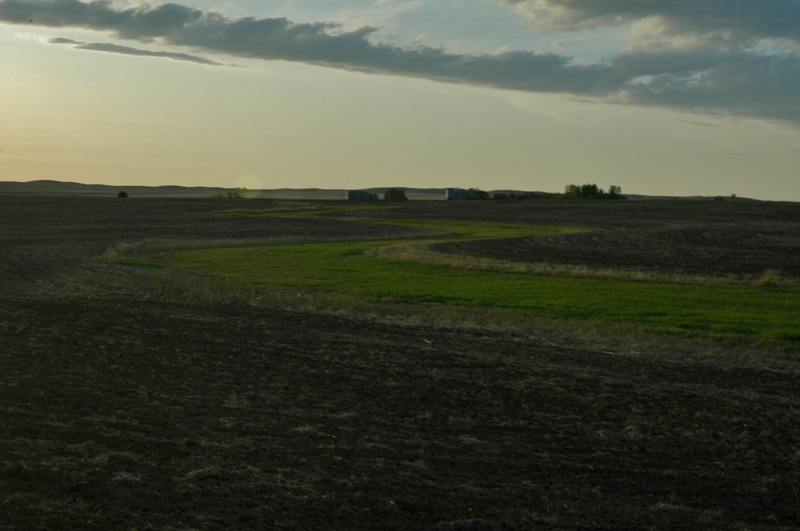 As for the boundary of the land itself, it was pretty clear, as are most land boundaries in Saskatchewan. The land was very precisely parcelled up by surveyors. I knew that after a half mile, this quarter section would end, and the next begin. It was also obvious by the change in the field; their field was stubble, ours was not. Also, at the end, there are little triangles of land where the farm machinery has had to cut corners to make the turn. This is a good Saskatchewan indicator of a land boundary, at least boundaries of farmland. After beating the bounds of my family’s original homestead land, I have a little better understanding of why they chose it, though their reasons are lost to time. 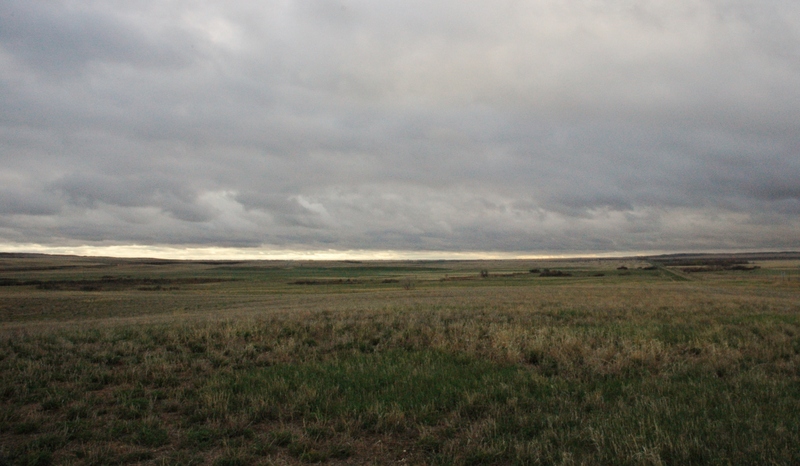 Whatever compelled or impelled my great great-grandfather to stake a claim on that particular piece of land, we still call it our own, and it’s one of the reasons why I’m here now. My great-great grandfather Thomas and his seventeen year old son Sherwood were amongst those first settlers to this part of the country in 1905. The surveyors had not even come through yet. 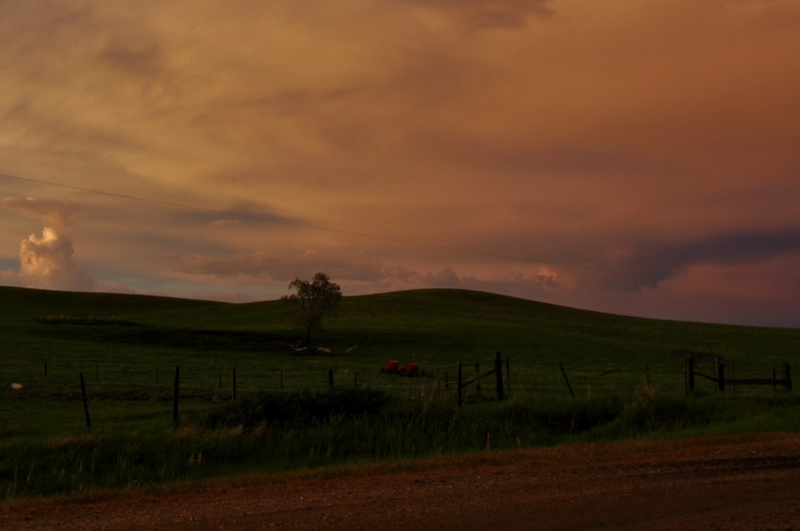 Saskatchewan would not be a province for another two months and was known still as Assiniboia, Northwest Territories. But they were not the first people to set eyes on it. The First Nations doubtless travelled across it countless times, though it appears they did not live in the area for any significant duration. 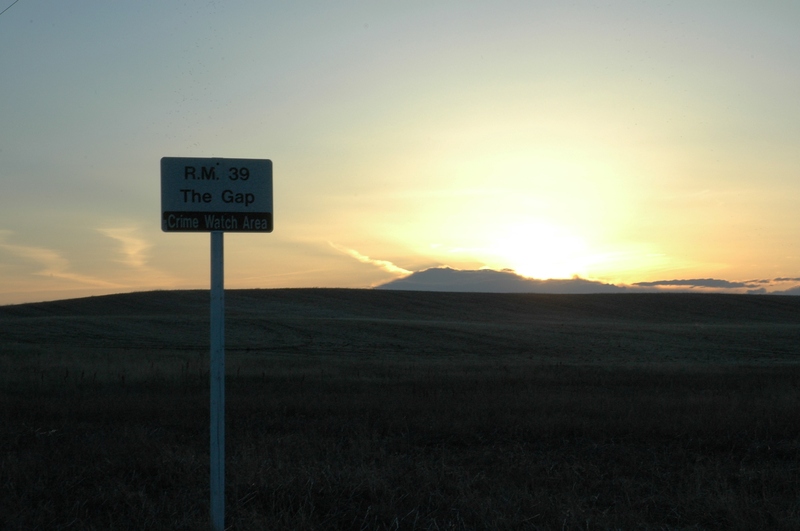 Also, there was the Willow Bunch trail. 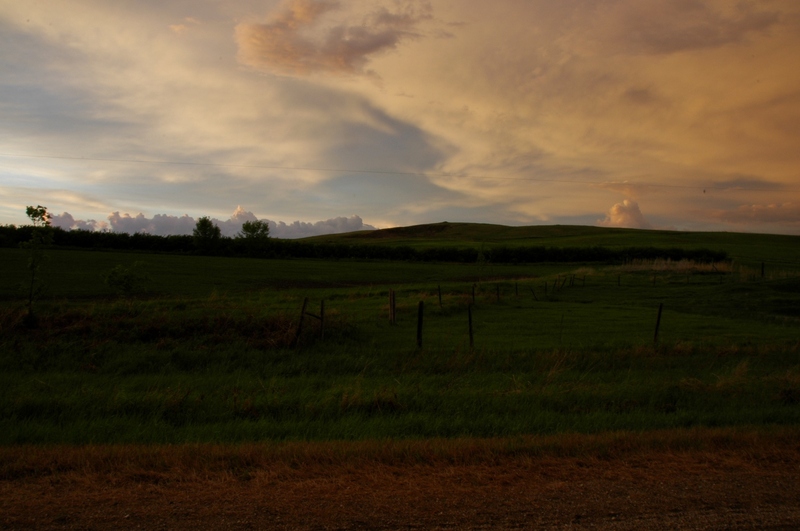 It connected Winnipeg to Assiniboia and passed through the Willow Bunch region sixty miles to the west, which had been settled by French ranchers in the 1870s. 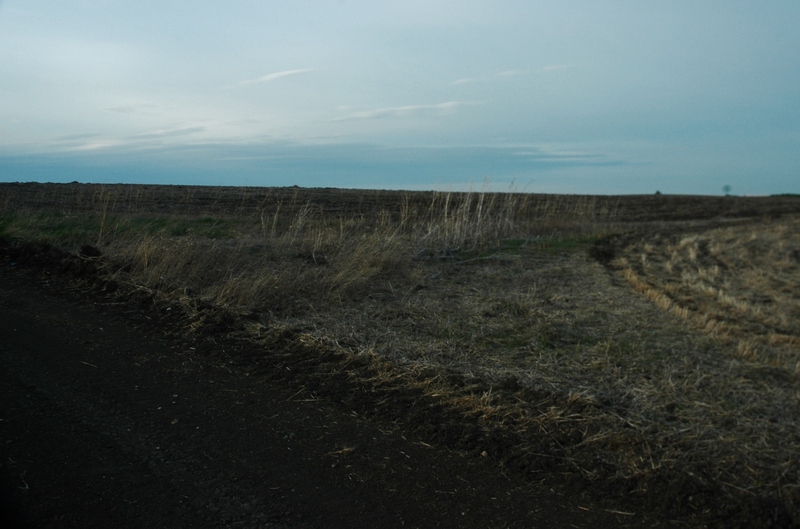 The trail was comprised of giant ruts dug into the virgin prairie by the cumbersome wheels of Red River carts. Apparently the ruts were visible for decades after the Gap country was settled. They’re gone now, perhaps replaced by the Correction Line grid road which forms the northern border of the Gap, just a quarter mile north of my farm. Perhaps it was one of my grandfathers who suggested the name “the Gap” for the new municipality which was formed in 1911. Maybe my great grandfather Sherwood, who because of his minority had had to request special permission for the right to file a homestead, said at the inaugural meeting: “let’s name this the Gap country because of that gap in the hills, the one we saw when we first set eyes upon this land that we would break so that we could make ourselves new homes.” He might have done. Or maybe it was one of the other men. Or maybe the whole story of the Gap being named the Gap because of a gap in the modest ridge of the Missouri Coteau is all folklore and there’s little truth to it all. Whatever did happen, or who said what, this place is called The Gap, specifically, the Rural Municipality of the Gap No. 39. R.M. of The Gap for short. The municipality, like those all around it, is 324 square miles in size, which can also be measured as nine townships (36 sections in a township; four quarters in a section). The gap in the hills for which it is named comprises only a small part of its overall area. But it is in that part that my family has lived for 109 years. The gap in the Missouri Coteau is not dramatic. No one would drive for miles and miles to see it. But it’s my home and it’s the landscape that shaped me. No matter where I go in the world, all of my experiences are filtered through my perspective as a girl who grew up in the Gap. There are a lot of different definitions for the word “gap.” No matter which definition you prefer, the etymology of the word remains the same. It’s one of the roughly 20 percent of basic English words that comes from Old Norse. It was exactly the same word in that ancient language, though today it is translated as “chasm.” It’s also related to the Danish gab for open mouth or opening. A chasm is a deep, dark place full of secrets, at least in my personal dictionary. And so I hope this blog will be: a place full of secrets. The secrets of the world we see around us every day, but rarely stop to ponder. Of all the many definitions of gap, I like the first one best: 1. a break or opening in a wall, fence, etc. Since it’s a dictionary (specifically, dictionary.com) there’s no connotation or implication provided, though at first glance it might seem to be a negative one. Who wants a gap in their fence or wall? But one could use a gap to wriggle through into a secret garden, or peer into the dusty gloom of an ancient castle. A gap is really a gateway, an entrance into another place. Folklorists like to use the word liminal a lot. A liminal space is an in-between place, a threshold. It can be literal or symbolic, though folklorists usually use it symbolically. A gap is a liminal space. A place in between. The second definition is good, too. 2. a break in continuity; an interruption; hiatus. Again, this definition might be perceived negatively at first. But I think breaks in continuity, interruptions and hiatuses can be good things. Necessary things, in fact. I need interruptions to my daily life, to routines and schedules. I may not always want them, but I need them. We all do. This blog, and the adventures I intend to create in order to fuel it, will be a hiatus from the daily grind – a gap in the orderly routine of everyday life. There are several more definitions, but I’m going to stop at the third one. I like groups of threes; there is a long history of folkloric and mythological significance in the number three. Also, this third definition brings us back to the beginning. 3. a break in a line of hills or mountains affording a route through. 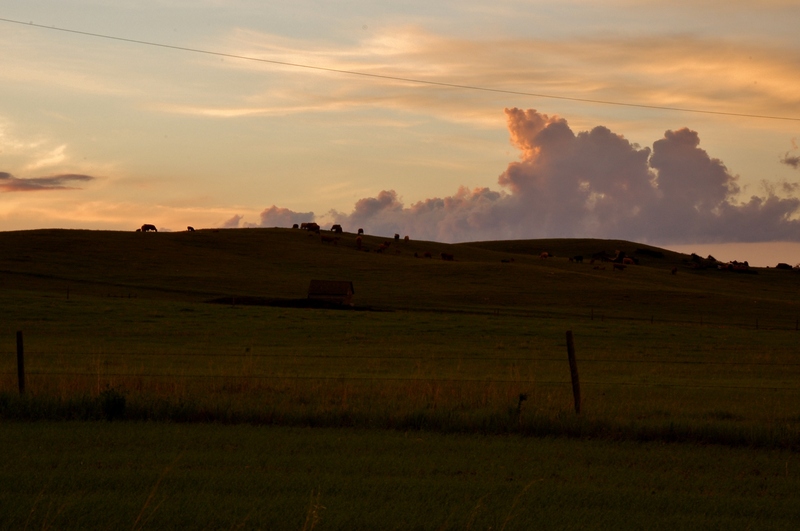 The rolling hills of the Missouri Coteau are not overly rugged, and the thought of finding a pass through them seems a bit silly in this age of all terrain vehicles. But in a Red River cart, the flattest route possible would have been vastly preferable to a hilly alternative. And so the Gap was a pass of sorts along the Willow Bunch trail. In “affording a route through” it allowed travellers to make their way more easily from one place to another. Perhaps this blog will allow me to afford a route through the mundane to show that there is another destination: one full of mystery and, dare I say, magic. To find out what I mean, you will simply have to keep returning here to the Gap. The Gap. Can you see it? * Builders of a Great Land: History of The Gap No. 39 Ceylon and Hardy. 1980. Ed. History Committee of R.M. of the Gap No. 39. Altona, MB: D.W. Friesen & Sons Ltd. The frogs are singing and I am home. I wrote that late at night, CST, on May 1st. I had just arrived home to my farm after four months away. My head and my heart were still living in Newfoundland Standard Time. My body moved through the familiar space of home with ease, but it seemed unreal to me. I was not happy or sad, I was neither here nor there. It was the strangest feeling, strange enough that I felt compelled to dig through my heaps of luggage to find my laptop, open it up, and write those words. And then I knew it was time to return to this blog. I wrote the first post, The Great White Winter, of this blog five months ago. It was not planned. I had taken some photos a few days before; one of them struck a chord and on impulse I created this blog, uploaded the photo, and started writing about it. I then put it on the back burner. I did not realise at the time that I was writing the first post on the winter solstice, that in-between day which tips the world forward, so that it begins to chase the light. I was at an in-between place at the time. It was only a few weeks before I was to leave for Newfoundland. I had spent the fall at home doing research for my thesis. I was settled in, I was comfortable, I was going through a rough patch, though I was only half aware of that at the time. I did not want to go back to Newfoundland at that point. The thought of leaving home, of crossing that great distance in the middle of winter, of being uprooted and transplanted at such an unforgiving time of year, was almost unbearable. But I went. I had things to do in Newfoundland, but I wasn’t happy about it. The transition is always hard. 2 a.m. arrival, rain melting towers of icy snow on the street, the air full of the sea. My sheets felt damp on my prairie skin. But my roommate, my friend, was there. And the next day more friends. The streets of St. John’s were familiar to me, though it took my flatlander legs a few days to get re-accustomed to their steepness. I was homesick, as always, but I was okay. In fact, I knew very well that I needed to be there, and not just because I had university to attend. I needed a break in my routine, I needed a fresh start in a familiar place. I needed to cross a bridge. The in-between place. Home, but not settled back into its familiar comforts, its sometimes dangerous comforts. My heart still in Newfoundland, that harsh place that welcomed me with its foggy, rocky arms and taught me so much about who I am. The place that I was always fascinated by, sometimes dismissive of, sometimes ambivalent towards. The place that has now, almost without my noticing, settled itself into my soul so that a part of me will always belong there. Home is my farm, the place I grew up, the place I love above all other places in the world. I have already written about my deep love for it elsewhere, and I don’t think I can describe it any better than I did there, in the journal Of Land and Living Skies. Page ten. Ever since I was young, too young to remember how old, I had a deep abiding fear that I would have to leave the farm someday. As I grew older, and read books and learned about the world around me and began to dream of far off places, the fear deepened, for I knew that it was inevitable I would have to leave. Circumstances befell us so that we were transplanted to the city. Not so far geographically, but a galaxy away. Things changed in the city. New friends, new things, new books, new dreams. But the farm, home, always longed for, frequently returned to. As I grew even older, I knew with certainty that I would have to leave someday, that I would have to go far away. I did not know exactly what it was I would do in this unknowable faraway place, but I knew I would have to go. I travelled, a lot, but always for just days or weeks, and always I was homesick. I didn’t know if I could ever face moving away. I delayed for as long as possible, choosing to study close to home, returning every summer to work in my hometown. But the day came when it was time to go. Acceptance into the Folklore programme at Memorial University of Newfoundland. When I opened the email, I cried. Not tears of joy, but those of sorrow for it meant I had to leave. So, what is this blog? 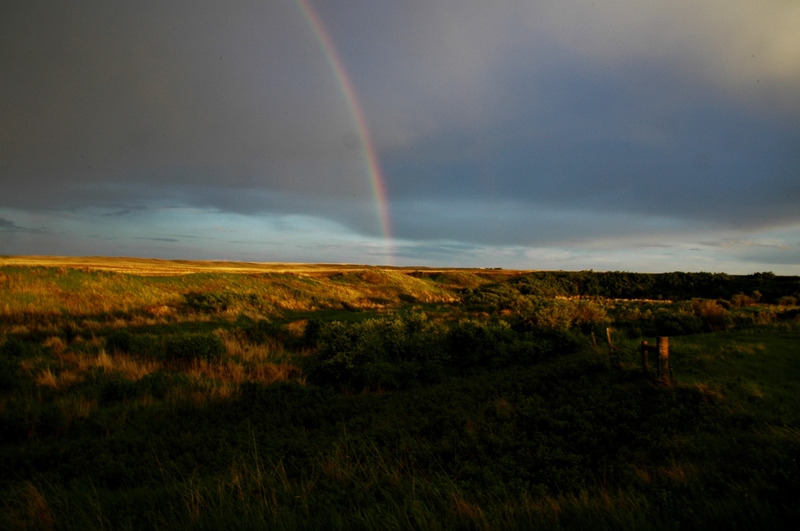 It is still taking shape in my mind, but it will be about place, specifically, this place in southern Saskatchewan, but also other places as they are seen and experienced by a girl from southern Saskatchewan who went away to Newfoundland to become a folklorist. It will be stories, and legends, and histories, and journeys, and adventures, and misadventures, and musings, and folklore. It will be chasing the light. Winter. The most vilified of seasons, especially in a place like Saskatchewan. But there is beauty in it. And memories. Winter is a time for remembering. Every time I take a walk around my farm, memories are everywhere. The day I captured this photo, one of the first days of true winter (long before the calendar said it was so), I thought about what it had been like to be a child growing up on this farm in this province. I hadn’t known then how fortunate I was. Sometimes I think I would do almost anything to return to those days of play. What about the house? What I know is what I have been told. I could probably dig for some facts, but what I know from what I have been told is enough for me in this matter. Not everything needs to be researched, cited and verified. The house belonged to my uncle. He was off somewhere else making his fortune, and so lent the use of the house to my mother and father. It is on my family farm. My grandparents, still alive then, lived in the other house. It used to belong to a school in Radville. It was a dormitory. Then it became a private home, and I know people who lived in it. My uncle had it moved sometime in the ’80s. It was a magical house to me. I lived there until I was four. I had nightmares there, and sweet dreams. 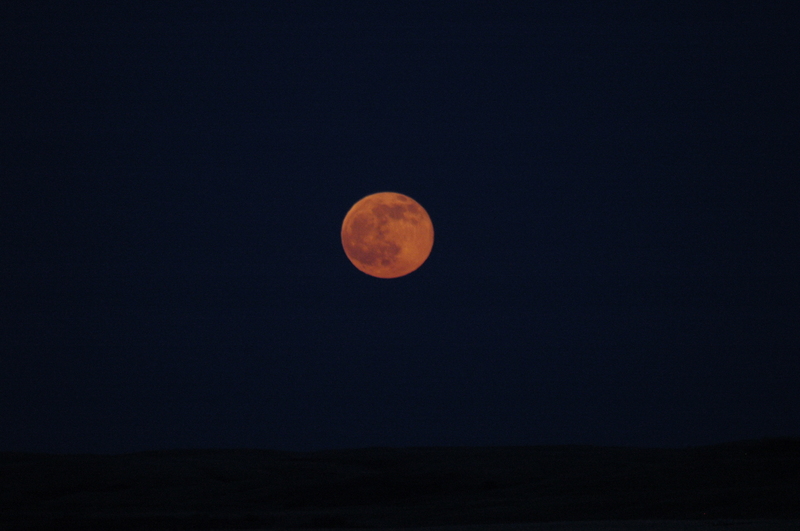 I looked at the moon out of my bedroom window, which faced south. I could see Ceylon – 4 miles south and 4 miles west – and her elevators. There were three, then. Now there are none. I could see my grandma’s house. My memories of her are few: parsnips, grapefruit juice, many cats, cat food at the bottom of the stairs. I sampled this cat food on at least one occasion. Salty. I’ve always had a salt tooth. There were “secret” passages through the closets into the adjacent bedrooms, a remnant of the dormitory, so I was told. It was mysterious and exciting to inhabit a house with secret passages. There were four bedrooms on the second storey, and a tiny bathroom. Downstairs was a long kitchen, a big living and dining room, a bathroom, an extra room, perhaps a study or a bedroom or a place filled with odds and ends. The stairs were large and scary. My room was full of shadows cast by the yardlight just outside my window. But my parents were always there to soothe me. My sister came along 2 and a half years later and I was jealous. I drew with soap on the walls. Perhaps the evidence is still there. I remember my father’s birthday – a chocolate cake. I remember a wooden riding horse, a gift from my mother’s father. We moved out when I was four, to the house next door on the farm. My grandpa had passed away and Grandma moved to town. So we moved. But my uncle lived there sometime after us, and his wife. And so the “big house” as I thought of it, was still part of my life. I have always loved it. It stands there still, though a bit worse for wear, unoccupied for many years now. Perhaps its life as a place of living is done. It was always the backdrop to children’s play. In spring, the melting snow would gather in a depression out front, and we played in the massive puddle that resulted, soaking through multiple pairs of boots a day. Barbies were floated on cardboard boxes. Kingdoms rose and fell. The deck my uncle built on the front became a stage. Sometimes the house was a graceful southern plantation mansion, other times it was an English manor house, circa 1550 or so. Other times it was a grand castle. It was never what it really was: a prairie house, first a dormitory, then a family’s home, then a farm house. Because I have a confession. When I was young, I was always pretending to be somewhere else: England, France, the American South, a made up land, Tolkienish, but of my own creation. 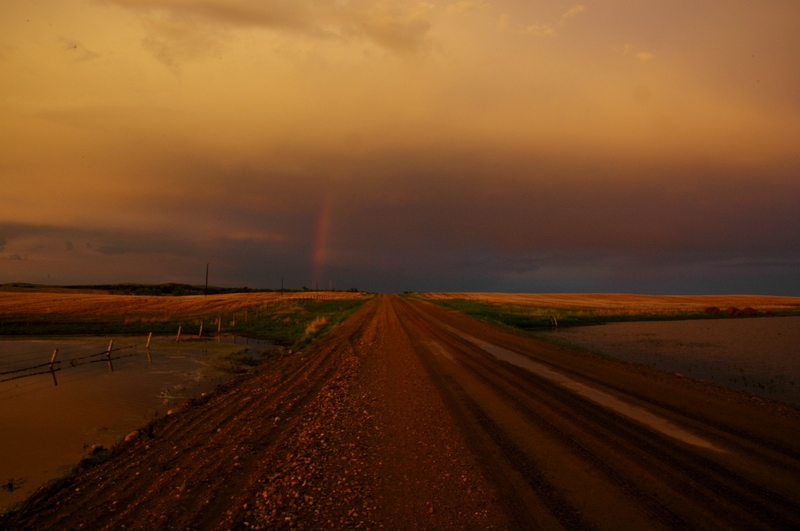 I wanted to pretend that I was not in Saskatchewan, because what was so special about Saskatchewan? The grand prairie surrounding me was just home, nothing else. It took me awhile to understand that I had grown up in the best place in the world.